If we mimic the healthy diet of our closest living relatives, chimpanzees – who are almost 99% like us and live virtually disease free – could we live disease free, too? Our digestive systems are nearly identical to that of chimps, so it only makes sense that we should be eating more like them. Wild chimps generally don’t have heart attacks, strokes, cancer, diabetes, Alzheimer’s or Parkinson’s disease, arthritis, headaches, ADD, depression, or any of the thousands of other illnesses and diseases (including obesity) that we suffer from today. 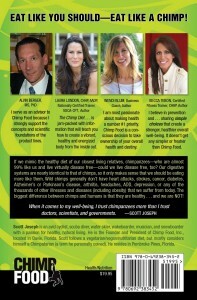 The biggest difference between chimps and humans is that they are healthy… and we are NOT! Out of all the species that populate our planet, we humans are the only ones to suffer from deadly diseases like heart disease, obesity, and diabetes. Why is that? This chapter discusses these and other alarming health disparities between humans and the rest of the animal kingdom. It’s only in places where humans have had a direct impact on animals that we find health issues in them like depression, seizures, allergies, obesity, and more. It’s our dietary habits—and the habits we impose on the animals in our lives—that are to blame. It’s time to pay attention to what nature is doing right, and what we’re doing wrong. What went wrong in human history that led us down this dark, disease-ridden dietary path? This chapter exposes the truth: the answer lies not only in what we’re eating, but how we’re eating it. More specifically, we’ve abandoned eating our food the way nature intended: raw, whole, and free of additives and chemicals. We’ve given up eating to live healthy lives in favor of eating for fleeting, sensual pleasure, and our bodies are paying the price. Our neighbors in the animal kingdom know better. It’s been said again and again that our closest living relative in nature is the chimpanzee. If we’re so alike and they’re so healthy, then what are they doing right that we’re missing? This chapter explores what makes a chimp’s lifestyle so much healthier than ours. We humans use every excuse we can think of to rationalize eating the junk we eat, while wild chimps eat only what is good for them and gives them the energy they need to enjoy life beyond the dinner hour. This means we have some serious house cleaning to do. So what does it take to clean our “dietary house”? Simply this: Get rid of the junk, and revert to your roots. That means no cooking, no prepackaged processed junk, and no “cheat days” or “just-this-once” binges. Your carnal brain may not like it, but your body will love it! And it’s not as bad as it may sound; eating raw, whole foods can be a delicious lifestyle change that won’t make you miserable. As this chapter explains, learning what to avoid is the first step to living healthier and happier. So you’ve cleaned out the junk from your diet. Now what? It’s time to take a lesson from our tree-swinging cousins, the chimpanzees. Don’t let their diet scare you—it’s easier than you think to eat selectively for health and satisfaction. This chapter teaches you which foods are best for your health and how to eat them for maximum nutritional impact. Combining chimp-like eating habits with fun, daily exercise will get you on the best track for health and dietary success. 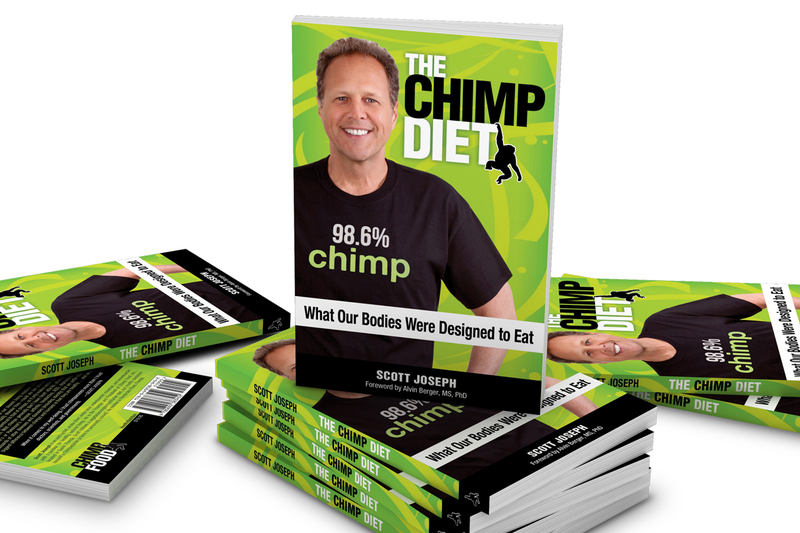 How can you apply eating like a chimp to your everyday life? It’s not just a matter of changing your eating; it’s a matter of changing your thinking. This chapter illustrates how to make the conscious decision to place your health at the top of your list of priorities. You’d be amazed how shifting just a few thought habits changes your entire lifestyle, and how easily these new habits become a part of your routine. When you change your thinking, you change your life—and in this case, the changes are nothing but positive! So eat like you should. 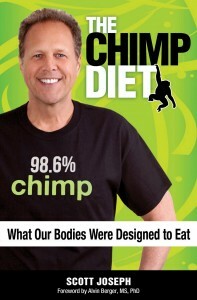 Eat like a chimp.